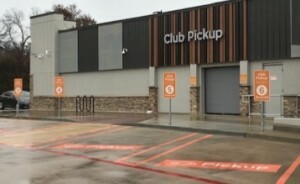 In response to the opening of new Amazon Go stores, Walmart and Sam’s Club are doubling down on its retail technology with an experimental store location in Dallas. At the end of October, the retailer announced its latest venture: Sam’s Club Now. The shopping experience is similar to Amazon’s cashier-less convenience stores but with a larger focus on customer engagement. Engage3 visited the Dallas store to see what Sam’s Club Now had to offer, and we were surprised by how similar it was to the retailer’s traditional locations. This latest offering by Sam’s Club is about one-fourth the size of its traditional stores and includes electronic shelf labels. The retailer suggested the possibility of camera technology in the future as well. Purchases are done through the Sam’s Club Now app which tracks the items in a customer’s cart. Once the app is downloaded, a shopper can make grocery lists, search for items throughout the store, and use augmented reality features on certain products. On arrival, the first thing we noticed was the curbside pickup spots outside of the store. Apart from smartphone integration, it seems that Sam’s Club is focused on ease and accessibility with this experimental store. 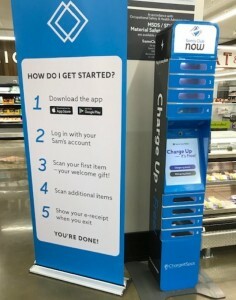 Once you enter with your club membership, you encounter a large charging kiosk with instructions on how to shop in the store. In order to make any purchases, you would need both a membership and a smartphone capable of downloading the app. There were no cash transactions in the store, so we had to rely on the Sam’s Club Now app. Thankfully, it was easy to set up. After opening the app and creating an account, we were ready to start shopping. From the entrance, we made our way around the store, noticing the electronic shelf labels that were set up throughout the aisles. It resembled the larger warehouse locations, but with a focus on items that could be easily picked up and scanned. However, products were still displayed and stored in the traditional Sam’s Club warehouse style. The pallets, bulk items, and stacked shelves made it clear that this was a Sam’s Club store. We compiled some photos of AmazonGo (left) and Sam’s Club Now (right) to give a side-by-side comparison. Beyond the center store, there were separate areas for dairy, meat, and produce. These refrigerated sections featured a more limited assortment than the retailer’s larger stores, but each area had enough space to add more products down the line. For checkout, the retailer is relying on its experience with the Scan & Go app introduced two years ago. The app we downloaded allowed us to scan each item in our cart and track its total. When we were ready to check out, the transaction happened in the Sam’s Club Now app. Once it was complete, the app generated an e-receipt which we had to show upon exiting. Associates near the exit scan a QR code generated by the Now app, putting the checkout experience somewhere in the middle of the spectrum from tracking cameras to human cashiers. We were thoroughly impressed by the app integration and electronic shelf labels, especially with how large the store is compared to an Amazon Go convenience store. Amazon Go and Sam’s Club Now are operating different store sizes, but the smartphone-focused technology looks to fill the same need for shoppers. Easier navigation in stores and convenient, secure payments are featured in both. While Sam’s Club Now may be a much larger space, this experimental offering shows that retail technology is exploding in popularity. With the recent announcement of Kroger and Microsoft’s partnership, the trend towards smart shopping continues to grow. To read our review of the Amazon 4 Star Store in Berkeley, California, click here.